The Olive Green cushion is created in monochrome cotton velvet with a lip edge. The cover is removable and fastens with a concealed zip. Our cushions can now be personalised with hand-stitched monogramming in gold embroidered letters for an added fee of £15/$25/20€. Please note that personalised items are non-refundable. Our interiors collection is handmade to order in London and ships within 4-5 days. Dimensions: 54 x 54cm Cover: 100% cotton velvet digitally printed in England - Cushion: 100% cotton case with 100% British sheep wool stuffing, Hand made in Sussex, England. Creative Director Amy Powney was inspired to create an interiors collection when renovating her own home. 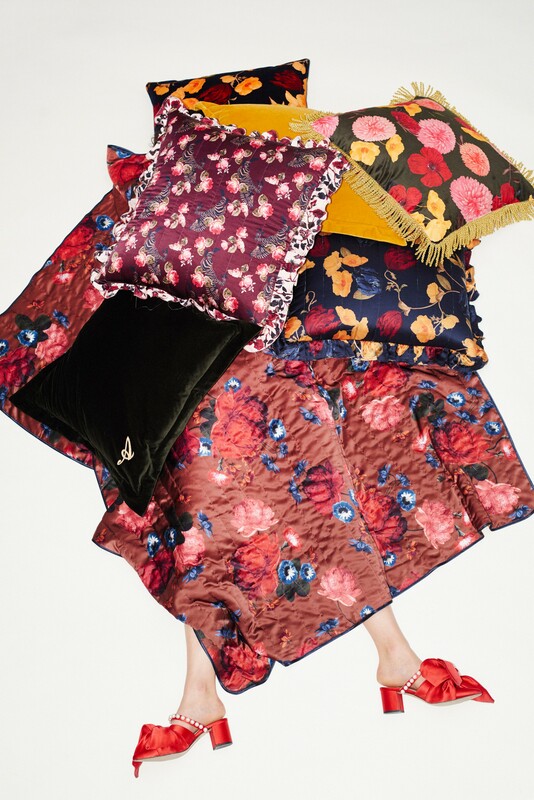 The collection is made up of cushions, pouffes and quilts in much loved and iconic Mother of Pearl prints. For every cushion sold, we get a place for a young homeless person to rest for the night and for every quilt we sell we donate a sleeping bag to the homeless through registered charities.